The only handheld mapping GPS designed by hunters for hunters now lets you follow the big game in brilliant color with 16-channel GPS precision! The new iFINDER® Hunt C with color display offers everything you'd expect in a versatile, precision mapping GPS unit made for the field, including hunting-specific icons, unique "Scout Mode", electronic compass, barometric altimeter, built-in microphone, and more! Also available with the Plus package - The iFINDER® Hunt C Plus has the same great features of the standard model, with the added plus of exclusive Map Create™ USA Topo mapping software, one MMC/SD memory card, and an MMC/SD card reader with USB connector - for custom, high-detail mapmaking on a PC. 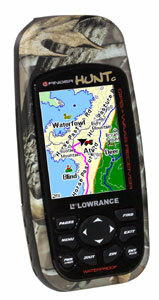 To order the Lowrance iFinder Hunt C GPS, add to cart. Lowrance iFinder Hunt C GPS SOLD OUT!